As I alluded to yesterday with my MPFR3DOM post, John and I will also be given a Brother Printer to test drive, taste test, sample, and play with for a little while. Here’s how marketing guru Darren Barefoot approached us. See other comics sent to Jordan, DaveO and Tanya. If you’re a blogger and would like to participate in the printer taste test, just contact Darren. That is definitely a cool comic. Never really thought about using photos in a comic. My wife was just talking about the Barefoot Effect the other day. She made me put on socks. Thank you, thank you, I’ll be here all week. Try the veal. Nice post! What did you use to do the Comic thing? I can think of a number of ways I could use that layout. 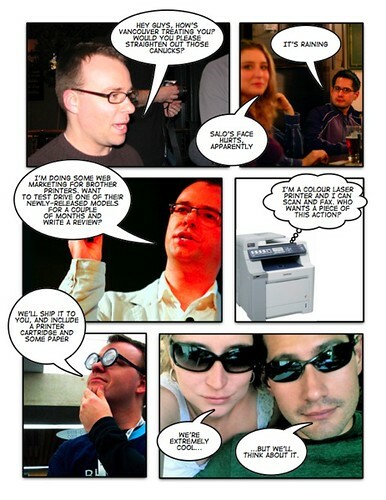 Andy: It’s a freebie called Comic Life that came with my MacBook–it’s a pretty awesome app. Man I really should get myself a MacBook….